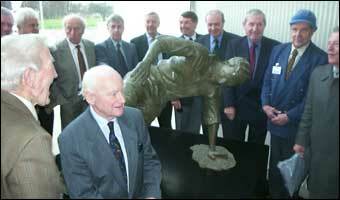 Sir Tom Finney - One of football's all-time greats - LFChistory - Stats galore for Liverpool FC! guaranteed to get the juices flowing down at the pub on a Friday night. 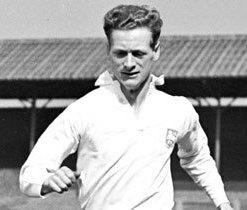 Many will have their own favourites and local loyalties will ensure a few oddball suggestions, but certain to be mentioned at some point wherever serious football drinkers and thinkers gather, is Tom Finney. Described by many observers as simply the best British footballer ever, Finney was twice crowned Footballer of the Year, in 1954 and in 1957. He played 473 times for his home town, and only club Preston North End, scoring 210 goals, and was capped 76 times by England, scoring an impressive 30 times. He was awarded an O.B.E. 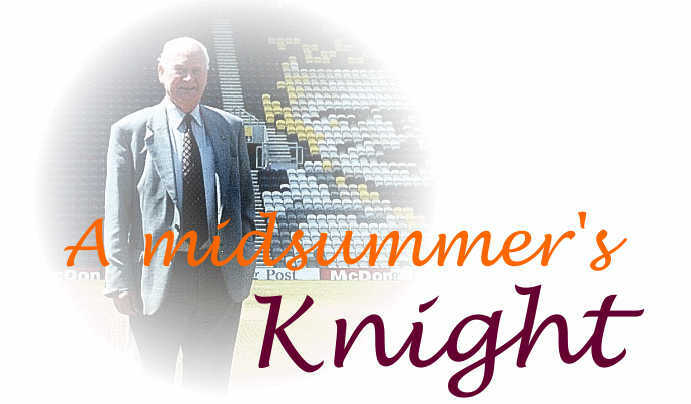 in 1961 and in 1998 was finally given a knighthood. The British establishment, never the most proactive of movers and shakers, certainly took their time to come round to the same way of thinking as the good folk of Preston, who had been calling him 'Sir Tom' for at least 40 years. "Pele was a great player. He must rank one of the best of all time. Now in his late seventies, Sir Tom assumes the role of President of the self same Preston North End, a club he has been associated with now for much of his life. This famous old club drips with history. Like much of industry in northern Lancashire, the club has known better times. It has long since lost its place at the leading edge of English football. The coming millenium promises better times with the scheduled opening of the new football league museum in the Bill Shankly Kop Stand and on the pitch too there are signs of a reawakening in the fortunes of the famous North Enders, but for now Preston makes do with the memories of a glorious past. All around the corridors and staircases of Deepdale are black and white photographs relaying the glories of yesteryear, 'The Invincibles', the teams of Finney, Shankly, Beattie and Mutch. Sir Tom is in no doubt the club is right to hark back to the glories of the past. "The memory of these players is very important. It's not a question of living in the past, and you've to think of the future of course, but you have to look at the history of a club too. You have to look at the foundations of the club and see how it was formed. The people here still talk about 'The Invincibles' who were the first team to win the double. It was only 15 or 16 matches but even so it's a fantastic achievement and it's important we remember that and that the youngsters read about it. It's important too to remember the poor times as well though people have a tendency to forget them. We see so many teams that have sprung up now that were non league teams in my day and Wimbledon are the best example. Great credit to them, they're holding their own staying in the Premiership, albeit in the bottom half. To do what they've done on the gates they have is wonderful and to think they must have sold two or three sides worth of players who've gone on to success at other clubs. That must be very satisfying really." Young Tom Finney signed as an amateur for Preston North End in 1937 as a fifteen year old. It was an era when the big boys in the first team were expected to keep their distance from the youngsters, but to a certain Bill Shankly, a cornerstone of the Preston midfield, such rules were meant to be broken. Sir Tom recalls, "He used to take an interest in the junior side and watched us whenever he could which was usually when we had a weekday match. He would always make a point of coming to talk to us, telling us how much he'd enjoyed it. He had a very keen interest in the game, for the youngsters particularly. He would tell us that he felt proud watching us and that we played for a great club. It lifted you six feet because as a junior you looked up to those sort of people." 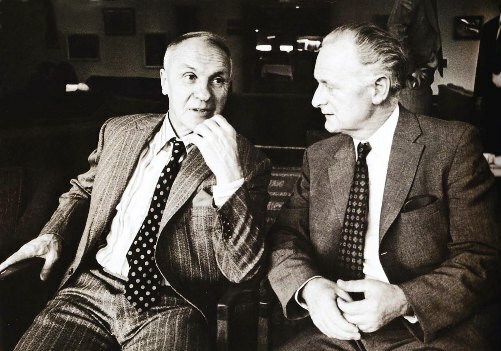 Two Preston legends: Shankly and Sir Tom. Indeed, it was Shankly who was to exert the biggest influence on Finney's burgeoning talent and a friendship that was to last the rest of Shankly's lifetime had begun. The onset of war of course in 1939 curtailed the careers of many of the day's star players. Shankly's career was hit as hard as anyone's. He was 26 and at the peak of his powers. The government decided that a wartime league of sorts would be set up as they recognised the importance of the national game to the morale of the country. Professional players who had gone into the service played whenever they could, often guesting for the local team where they were stationed. The young Tom Finney, still to make his professional debut, suddenly found himself playing with the stars of the day in far off lands. "We played a lot of football during the war. Most teams would play with guest players who had managed to get time off from forces duty. I played in the wartime cup final against Arsenal in 1940 and it was a wonderful ocassion for me to play at Wembley as an 18 year old. I was 24 when the war finished and maybe that's why I was able to go on so long but as I said, I played an awful lot of football in those years. In Egypt and Italy I played with the 8th Army Team and with a team called the Wanderers and the standard was still very high. You played with very elite company and it was wonderful morale for the men in the forces." In the immediate post war period, many clubs decided a fresh start needed to be made and players who had given sterling service before the war were cast aside. For Bill Shankly, the end of a playing career beckoned whilst that of his talented colleague was about to flourish. "He was very aggrieved at not being retained by Preston as he still felt he had a few years left in him. In those days they put your name up on the retained list in the dressing room and you used to go along and hope your name was on it. Bill looked and found his name wasn't on it and I think that happened to a lot of players at Preston who had been in their prime at the start of the war but were then looked upon as spent forces after it. He was very bitter about missing out on his testimonial. In those days you received benefit money as a professional which was £150 a year and if you moved after three or four years it was supposed to accumulate but many players never got anything at all. They were swindled out of it really. We never heard about Bill's benefit money being witheld until he had his testimonial at Liverpool and then it all came out. It was the management that had all the power in those days and now of course it's turned complete circle and it's the players who have the power." The end of Shankly's playing career had seen the start of an initially stuttering managerial one. Sir Tom remembers being surprised at how Shankly put his foot on the managerial rung. "He always struck me as a person, who without football was non-existent. I always thought he would stay involved in football in some capacity after he finished playing. That was apparent to me from day one when I met him. I thought he would probably go into the coaching side and if he made a success of it move into management, but of course he went straight from playing into management at Carlisle. He did well there and then managed Workington, Grimsby and Huddersfield but it was Liverpool where he really made his name. The club landed on its feet when Bill arrived! He turned the whole concept of the club upside down and in very quick time got them out of the Second Division into the First Division and then they went on to make such a huge impact in the British game, and Bill was at the forefront of all of that." It intrigued me that I'd never read anywhere of Shankly trying to sign Finney for one his clubs. "I can't really say whether he ever came for me or not, but you have to remember that I was more or less finished as a player when Bill started to make his name as a manager with Liverpool." Sir Tom Finney remains warm in his memories of Bill Shankly. Every anecdote, every story is punctuated with the phrase, 'wonderful character'. He is clearly proud that the club has seen fit to recognise both men by naming their two new stands in their honour. 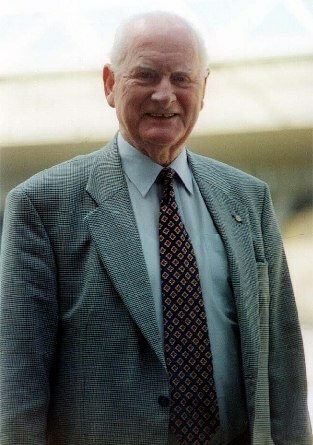 We climb into the stand that bears his name, and Sir Tom Finney tells me his hopes for next season. "Hopefully we'll get promotion, and go up as champions." Down below, the pitch is being relaid in preparation for next season's promotion drive to Division 1, a restructuring of the terracing crash barriers behind the Town End goal is taking place, and at the other end of the ground, to our left, the aforementioned Bill Shankly Kop stares back across at us. The images of these two great players are pressed into the seats of their respective stands. It's a potent mixture of old and new. The brand new stands, a crumbling terrace, a ripped up pitch, and Shankly and Finney frozen in glorious youth. "He played here at Deepdale in my testimonial. I remember ringing him up, he was managing Liverpool at the time, and I said to him 'Bill they've given me a testimonial and I'd like you to come as linesman'. He was most upset. 'What the hell are you talking about, linesman?, I want to play. And of course he did. He couldn't believe I'd thought he was past it!" "Whose face are they putting in the next new stand?" I ask, "Tommy Docherty?" Sir Tom laughs and gives nothing away. "They'll be arguing that one for a while yet" he chuckles, and we make our way across the track behind the Town End goal. The workmen down tools for a moment and joyfully acknowledge Sir Tom and he waves back a cheery hello. Sir Tom belongs to the people of Preston and there is much mutual respect. I take my pictures and Sir Tom indulges me with unrelenting politeness. Not only one of Britain's finest footballers, but one of Britain's finest knights too. 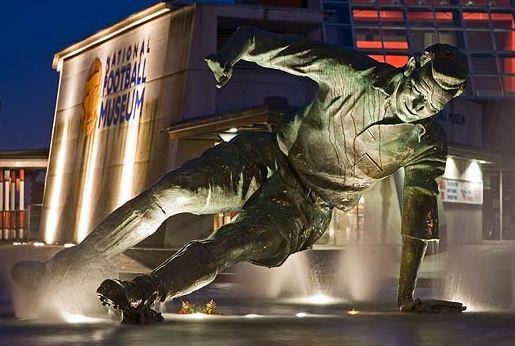 In February 2002, to celebrate the forthcoming 80th birthday of the great Sir Tom Finney, a statue was unveiled at the National Football Museum at Preston's Deepdale ground depicting a most famous moment from his career. 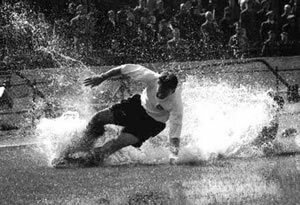 'The Splash', as it became known, showed Finney controlling a pass from colleague Tommy Docherty under atrociously wet conditions at Chelsea's Stamford Bridge. At the unveiling Sir Tom said, "The game was in 1956. There had been a big downpour just before the kick off. The match would not have been played today because there were huge pools of water on the playing surface. I was going past a defender and the ball ran in to a pool of water. It was a fantastic photograph and it won the Sports Photograph of the Year award. The sculpture is a true likeness. It's always nice to look back on photographs of your playing career and I'm very proud that the statue is being displayed in the Museum. I'm honoured that so many ex players have come here. Some of them have come a very long distance."